"This Reciprocal Link Exchange Script Takes All The Hard Work Out Of Accumulating Back links To YOUR Web Sites Or Blogs"
If you run any type of business online then you should know the importance of building and maintaining back links to your web sites and blogs, It can be time consuming job and lets face it is mind numbingly boring. Link Exchange Pro handles all the boring time consuming tasks giving you the ability to concentrate on other things that need your attention. This fully automated reciprocal link exchange script handel's Link submission, back link checking, the script even removes the links of sites who are not linking back! Link exchange pro comes with a clean and simple front end, ad integration with the option to include ads either side of the page from the admin area. Categories based, Admin editable link categories. 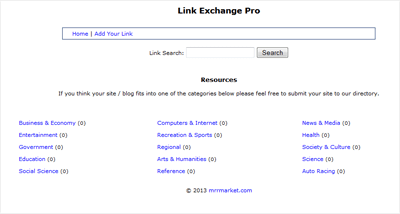 Link Exchange Pro lets your web site visitors search for links using the built in Link Search. This also helps other webmasters and site owners who are still checking back links the old way by hand. Easily add and edit and view link categories. add as many link categories as you wish (we have included some base categories to help get you started). Check and view links that have been accepted by Link Exchange Pros automated processes. Check and view links that have been Flagged for Non-linking (not linking back to you). Change the desired link you wish back links point to. 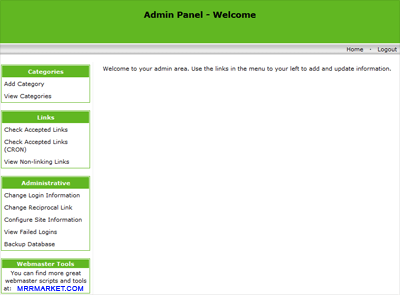 Update admin login info and site details and onsite text. Link Exchange Pro makes Link Submission a breeze. Full instructions are given during the two step process to the web site visitor along with all the needed info. 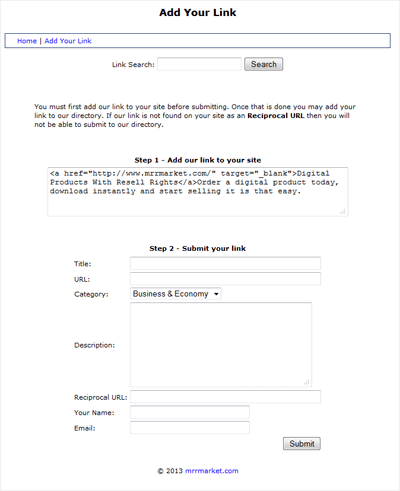 Step #1 Add our link to your site. Once the web site visitor has added our link to their site / blog and we were able to detect it will the visitors link be added to our link directory. Step #2 Submit Your Link. Visitors can specify The title of the link, the links destination URL, choose link category, ad a detailed link description. We also ask the visitor for the web site URL where our link is to be found, the web site owners name and contact email to help you with building relationships with other webmaster and to chase up non linking sites. Link Exchange Pro setup is very straight forward you do not need to be a tech head to install it. Well to be honest when I was developing this software I wanted to make sure that it would be available to anyone who needed it at a very reasonable price. And I’am sure I could easily sell many copies of the Link Exchange Pro software in the $57 - $67 price range. Includes Free Lifetime Updates - (Worth $47.99). You will own the Private Label Rights to the Link Exchange Pro script...What does this mean? This means you can do what you like with it, as if you wrote the code yourself, its totally up to you what you do with it. You can resell the product with either Master Resell Rights or Private Label Rights for any price you like. The software is distributed 'as is' and with no warranties of any kind, whether express or implied, including and without limitation, any warranty of merchantability or fitness for a particular purpose. The user (you) must assume the entire risk of using the software. In no event shall any individual, company or organization involved in any way in the development, sale or distribution of this software be liable for any damages whatsoever relating to the use, misuse, or inability to use this software (including, without limitation, damages for loss of profits, business interruption, loss of information, or any other loss). Refund Policy Due to the digital nature of the software and the extremely low price, No refunds will be offered / given.